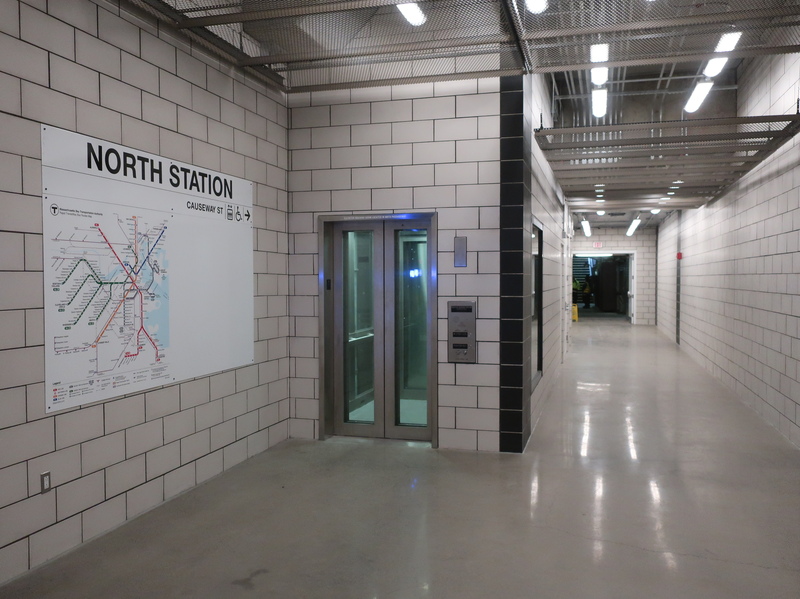 New North Station Pedestrian Tunnel! Well…this was a surprise! 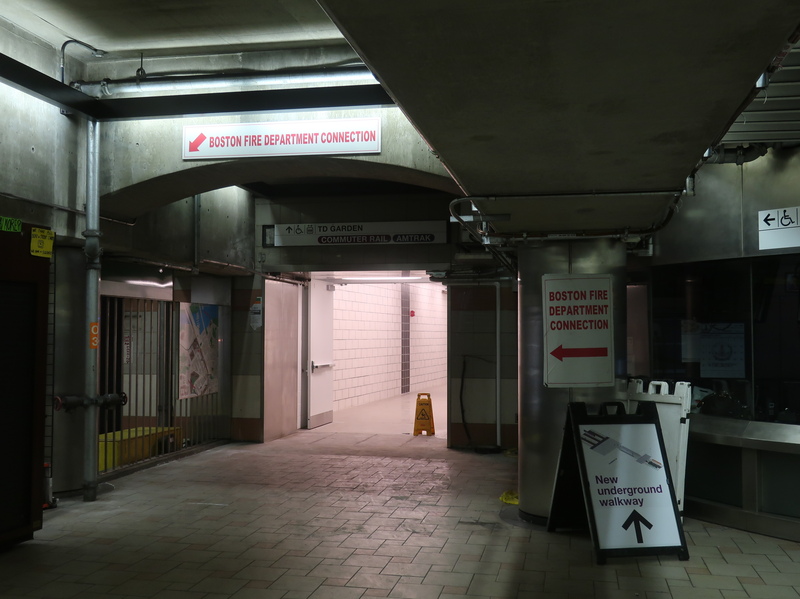 No one really knew when the underground walkway between the subway and the Commuter Rail was going to open up, but the most recent rumor had been that it was slated to open tomorrow. I guess they decided to do it a day early, though, because as of today, the walkway is now up and running! Will it be enough to raise North Station‘s score to a 10? Let’s find out. This was such a shock to see! 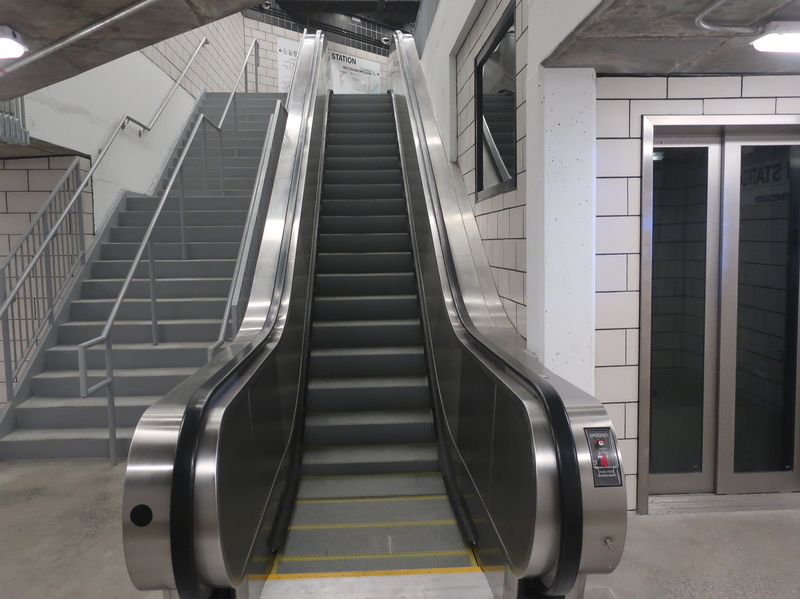 From the subway, the entrance to the walkway comes straight out of the fare gates. The MBTA’s signage has been really on point lately, and they did a great job here directing passengers to the new route. The screen showing Commuter Rail departures wasn’t working when I was here (maybe it hasn’t worked for a while, I don’t know), but once they get it fixed, it will be in a great location right next to the tunnel entrance. A new elevator partway down the hallway. First thing’s first, this tunnel gives us a new elevator leading to the north side of Causeway Street. The elevator itself is great and while I can’t see the entrance being too useful (there isn’t much outside of TD Garden and the station on this side of the street), it does provide a redundant elevator in case the one directly to the station needs maintenance. The signage to and from this entrance is excellent as always. I had concerns that the walkway would be too narrow, and as it turns out, I was right…sort of. 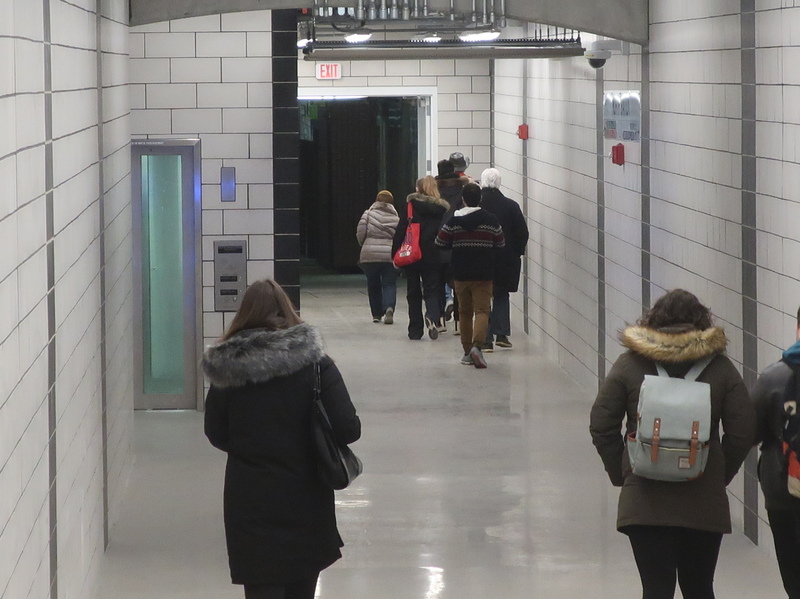 The majority of the passageway is actually quite wide, but the elevator entrance to Causeway Street juts out and creates this bottleneck just before the subway entrance. I don’t think it will be as big of a problem as what we’ll see later on, but it is something to note. 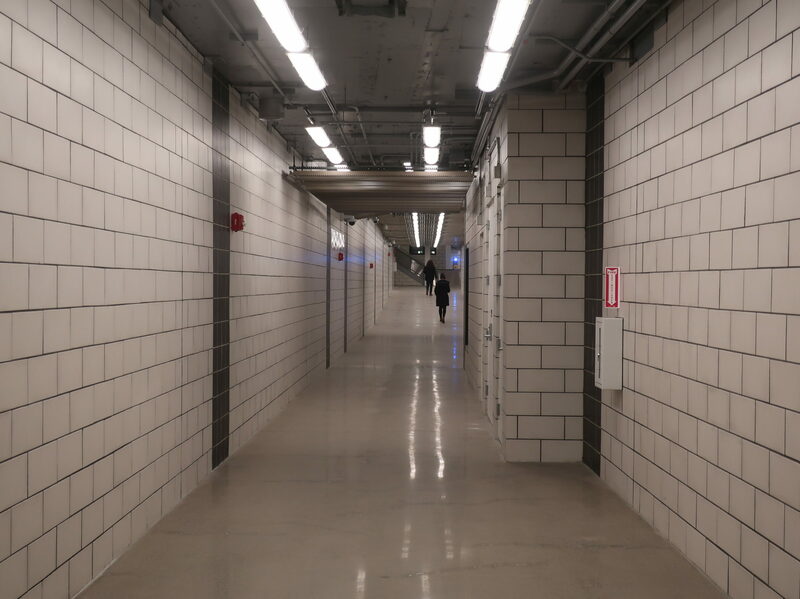 The tunnel looks fantastic, though, and it’s currently squeaky clean – we’ll have to check back six months later and see if that still holds true, though. The walkway ends with a choice of stairs, an escalator (which wasn’t working this morning), and an elevator. This, I fear, is where the rush hour bottlenecks will be. Look at the stairs – they are really narrow, and the constant divider in the middle doesn’t help. I was here on a Sunday, and I ran into someone coming down on the left. Imagine trying to go in the reverse peak direction here against the swarms of people walking the other way. I hope I’m wrong about this, but the narrow staircase seems like a recipe for congestion. For the escalator, I think the best tactic would be to run it in the downwards direction during the morning rush (I assume its default will be up). That will essentially double the capacity in the peak direction, which may just leave a little more room for riders travelling the other way. 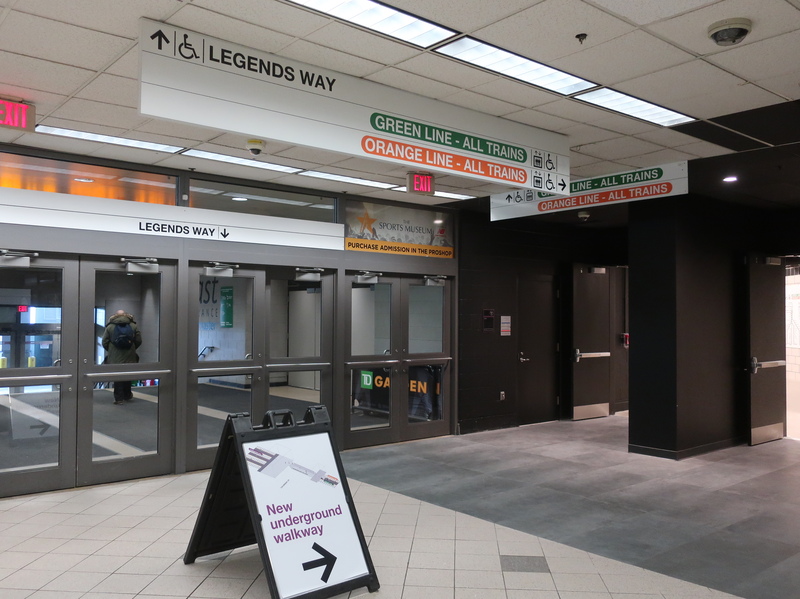 Once you get up to the landing, there are Green Line, Orange Line, and Commuter Rail maps before the doorway leading into the station. It drops you off right next to the exit that one would’ve used to get to the subway before the walkway opened. I just have one problem: I wish there were Green and Orange Line countdown clocks somewhere at the beginning of the walkway! Yes, they still exist in the foyer leading out the Legends Way exit, but that’s not super useful for someone using the new tunnel. They do broadcast all countdown announcements within the passageway, but being able to see the clocks and know how fast you have to walk or run would be fantastic. Look, people are using it! Despite my complaints, this tunnel is such an amazing upgrade to North Station. To see just how useful it is, I decided to time the old method of getting to the subway versus the concourse, with a few rules: walk at a steady pace, climb steps one at a time, and no jaywalking. I was unlucky with the lights taking the aboveground route, and it clocked in at 3 minutes, 47 seconds. The concourse? 1 minute, 56 seconds, plus warmth and protection from the elements. Okay, that settles it for me. North Station‘s new score is a 10/10!